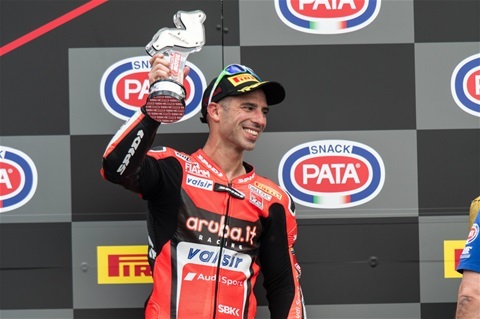 The Aruba.it Racing - Ducati team took yet another podium at Imola (Italy), home of the fifth round of the 2018 WorldSBK Championship, with Marco Melandri 3rd in Race 1. The Italian, fourth during Superpole, got off to a strong start and fought in the chasing group early on, then pulled away thanks to a progressively better pace, taking his fourth podium of the year. Chaz Davies faced a uphill race as, after taking first row during Superpole, he was penalized by a difficult start and a brief run-off during lap 2. The Welshman did not surrender and showed a pace worthy of the front, climbing back from 8th to 4th. Davies will thus start Race 2 from pole position. Michael Ruben Rinaldi fought for the virtual podium until half-way through, then he was forced to drop the pace a bit and finished in seventh position with the Aruba.it Racing - Junior Team. The Aruba.it Racing - Ducati team and the Aruba.it Racing - Junior Team will resume action on May 13th at 09:35 for a warm-up session ahead of Race 2, scheduled to start at 13:00 local time. "All in all, we can be happy because I couldn't have done more today. It was a hard race, and early on I was struggling with a full fuel tank and I couldn't keep up with the Kawasakis. I tried everything I could, and I made a couple of mistakes as I was on the limit. From lap 10 onwards we've been really fast, so we need to analyze the data to restart from there in Race 2 tomorrow. I want to thank the home crowd for their support, the atmosphere is always incredible here and this podium is for all of them." "Unfortunately we couldn't get a good start, then I went straight at the last chicane, so I had a quite a bit of catching up to do after that. In the end our pace was really good, so I think we could have fought for the podium if not the win, but we came through just a little too late. Looking at the positives, tomorrow we'll start from pole position. It's the first time I'll be able to take advantage of this rule, but we can also still improve a few details." "I started off quite well and my goal was to stay with Melandri, but I made a small mistake. After that, I pushed really hard to recover but, when the tires drop, I still struggle a bit. This is what we'll work on, we only need experience. Aragon was similar, but today our gap was narrower, so the trend is positive. We still have plenty of room for improvement." "It's been a hard fought race, in which our riders gave all they had. Marco, after some difficult rounds, could take advantage of a more stable bike and his podium leaves us hopeful for the upcoming rounds. Chaz unfortunately was penalized by some struggles early on, but he's shown a strong pace. We'll work hard to come home with better results tomorrow."